Please note that the content of this book primarily consists of articles available from Wikipedia or other free sources online. 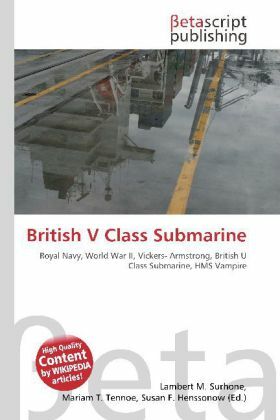 The British V class submarine (officially "U-Class Long hull 1941-42 program") was a class of submarines built for the Royal Navy during World War II. 42 vessels were ordered to this design, all to be built by Vickers-Armstrong at either Barrow-in-Furness or at Walker-on-Tyne, but only 22 were completed. Note that 7 of these vessels received ''U'' names (conversely, 4 of the ''U'' class had received names beginning with ''V'').